This is a long video showing the whole process of setting up and stitching a quilt with an edge to edge pattern. 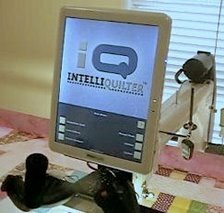 (version 01.30.13) In this video the whole quilt is set up, sequenced then stitched, using clip to trim three edges. The sides are basted and realigning is shown for two rows. The first 14 minutes show how to set up a pantograph. Note, that when the sides are clipped, the stop marker does not show on the 'adjust' page. That's because 'mark off' is selected in the ribbon of buttons immediately below the image. When the sides are clipped, the transition choice is continuous - that wasn't pointed out. The transition choice should be checked before exiting the 'adjust' page. NOTE: a change has been made to adjust with the latest software version. In the video I simply tap the button to switch from tweak to clip. To stop the wrong adjust mode being selected by accident, this has been changed. After touching the button at the bottom left, you now have to touch the plus or minus sign button to change from clip to tweak or vice versa. At the beginning the timers are re-set - they weren't checked at the end of the video but were checked after the filming stopped. The project time was 1 hour 13 minutes, the stitching time was 26 minutes, a little less than iQ indicated on the sew quilt page. The timers were started after loading the quilt - to get a true project time, start them before loading the quilt and stop them after removing the quilt from the frame. This post links to Youtube, but the whole width is not visible here. This is the link if you prefer to watch it on Youtube.